You can’t lose with luge! I am proposing that we start a Luge Club for all of us inspired non-Olympians. I think Luge is the perfect sport for us to channel our Olympic excitement and long-held aspirations. For starters, many of us have not surpassed the average age of competitors yet, so there is definitely time to shine. My goal is to debut some GC students to Beijing 2022. It could be you! 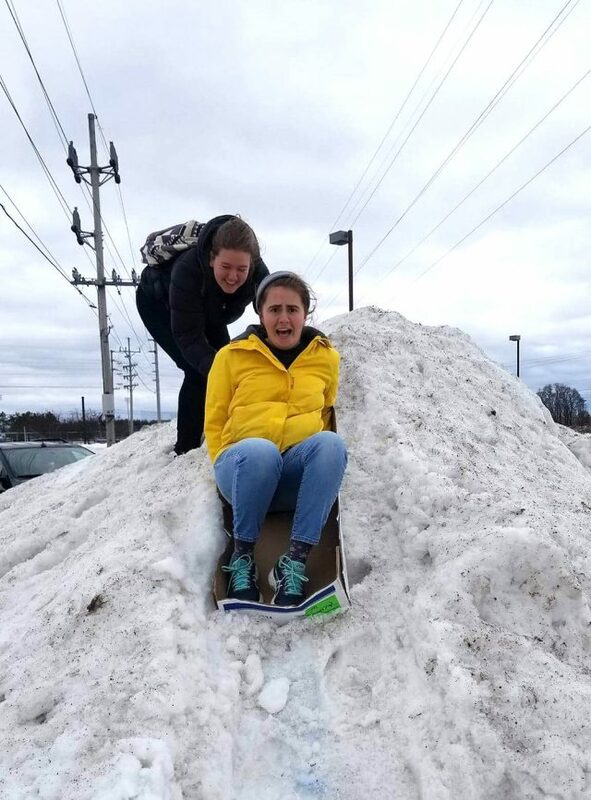 Additionally, we have already developed a preliminary track, known as the Newcomer Parking Lot Snow Pile Track (3rd of its kind in the country), and some students have even been working on smoothing out the turns for our fellow lugeists. We have some training sleds under works (thanks to our informal sponsor Dos Amigas for the cardboard flower boxes you kindly donated to the recycling bins, I’m impressed they were human-sized), and will soon iron out the small details, like adding those nifty steel bars to increase our speed on the sleds. If you are concerned about our matching team high-tech designer speedsuits, don’t worry: our first planned purchase will cover that, and the unique booties in one go (unicorn onesie pjs anyone?). Thanks Student Senate in advance for your continued support of our Luging Endeavors! Now, if you haven’t seen our new track yet (it’s warmth-shy, be patient), and need more to entice you (for reasons I can’t comprehend), let me divulge to you why LTL® (Learning To Luge), will be the greatest endeavor of a lifetime. Firstly, have you ever wished those awesome summer water park features could be turned into a sport, so your “uncontested mastery” of the cannonball at the biggest waterslide could be recognized internationally? Well, here you have it: luge tracks have been compared to “frozen water parks”, (albeit hopefully without flips, dives, or cannonballs) so your sliding prowess can be a year-round gold-medal-winning skill. But don’t let me fool you. Luge is not a sport for you Lazy River people. No, no, no, we will be enjoying quite a brisk pace down the track (upwards of 90 mph). Furthermore, if your astronaut ambitions have not yet been fulfilled, you can experience astronautical forces around the turns (5-6 Gs = 49-58.8 N/kg of acceleration). Although safety is not a concern on our current training premises, as we grow we will adapt and bring in the luge helmet (the only piece of safety equipment). Alright, your interest is piqued. What do you need to know for your first day of training? 1. Always go feet first (your parents were right on this one, folks). 2. Steer by flexing your calf against the outer edges of the sled. 3. If that isn’t sufficient, steer by shoulder dancing into the back of your sled. 4. Bring a friend! Luge can also be done in pairs. 5. Don’t worry about braking, your sled has no mechanism. (If you really, really need to, just sit up and let air resistance slow you down). I can’t wait to see you all on the first day of training!